I have a sweet tooth so I eat a lot of desserts and sugary pastries. 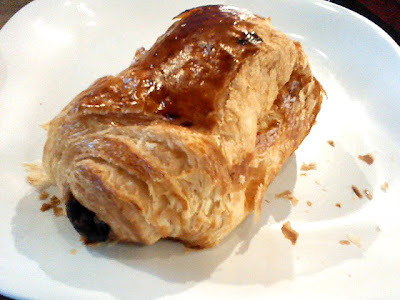 I have to admit that I will be hard pressed to find a chocolate croissant that lives up to the one I found at Vanille Patisserie in Chicago, IL last week. My husband and I walked through pouring rain to get to this little bakery so I was hoping the hype I’d read and heard about the place was worth it when we arrived. It’s a quaint little shop where we were greeted by a friendly woman behind the counter. They have two little tables for those eating in and a small couch and table with a book showcasing their pastry work. The display is filled with pastry art pieces. I’m sure they are delicious, but I’d be heartbroken to destroy such beauty by taking a bite (okay, maybe not that heartbroken). I decided on a chocolate croissant and a latte. I splurged my day’s extra calories on whole milk because that’s the only choice they have (fitting for a pastry shop). I usually add caramel or syrup to my latte to balance out the coffee flavors, but instead I added lumps of sugar (yes, lumps!) and it was one of the best I’ve had. They use Illy espresso, so the quality is implicit. The chocolate croissant was everything reviewers had promised. Rich, buttery, flaky with just the right amount of chocolate in the center. What a lovely way to start the day. We ate lunch at the Weber Grill Restaurant in downtown Chicago and it was fantastic. Okay, I’m breaking my rule about chain restaurants again, but it’s worth it (plus, this one only spans two states and has four locations – so is it really a chain?). We arrived at prime lunch time, about noon. We only had to wait 10 minutes for a table in the dining area, though we could have been seated right away in the bar. Service from the start was extremely attentive and personable. Our waiter was very helpful with suggestions on the menu when I had trouble deciding between three items and helped me settle on just the right one. Before our meal were were served fresh pretzel buns with traditional sweet cream butter and a cheddar butter. If you’ve read my blog postings before you may know that I have a special weakness for pretzel bread that’s done well, and this was. The rolls had that unique pretzel flavor with a warm and soft interior. The cheddar butter was an interesting change and the cheddar flavor wasn’t overwhelming. The sweet cream butter also went well. I ordered the barbecue chicken entree which included corn bread (my deciding factor on this dish), baked beans and coleslaw. There indoor grilling method on the specially designed Weber grills in the restaurant really did the trick. You would never know that this chicken was prepared indoors. It had the flavor of an expertly prepared outdoor grilled dish with perfect char lines while keeping the meat moist and tender. The barbecue sauce was a sweet tomato based version with nice flavor balance. 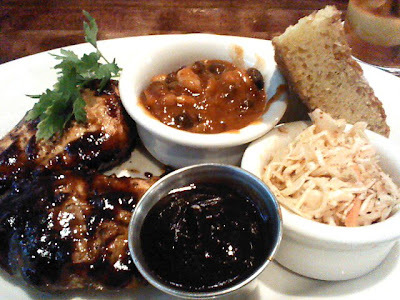 The cornbread was lightly sweetened and the coleslaw was simple, but good. The baked beans which had a few bits of pork shoulder for richness and texture were a special treat. Sweet and smoky flavors with a mix of kidney beans and white beans for a nice contrast. I got much more than I expected from this restaurant. It will be a regular stop when I’m back in Chicago. I finally made it to one of the famous Rick Bayless’ restaurants when I was in Chicago last week! I’ve been to the city six or seven times now and for one reason or another it hasn’t worked out to make it to one of his restaurants and I’ve been very disappointed until now. This time we almost missed lunch at Frontera Grill because we didn’t make it in until 2:15, lunch ends at 2:30. Thank goodness for good service – they were still willing to seat us that late! We started with an appetizer of black bean corn cakes, called Tlacoyos de Tocino, flavored with bacon and an avacodo mash. Three cakes came with the order and every bite was wonderful. The crisp outer texture contrasted nicely with the warm soft black beans, salsa and cheese in the center. I’m not usually an avocado fan, but the mash added a nice texture to the dish that wasn’t overpowering and it was light and fresh. 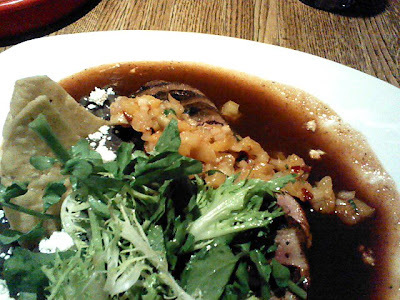 I ordered one of the house specialties for my main entree, Pato en Mole de Chabacano. It’s a red-chile rubbed duck breast served with on apricot mole sauce and garnished with a delicious fruit salsa. The plate comes with a side of black beans and fresh mixed greens. This is hands down the best dish of duck breast I’ve ever eaten. The duck was perfectly cooked; tender, but not greasy. The fruit elements in the sauce and salsa married perfectly with the light heat in the chiles. 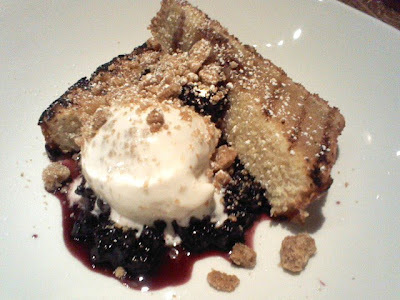 For dessert we chose the corn meal pound cake, Pastel de Maiz, Helado de Maple, with maple crunch ice cream, blueberry salsa and a maple-goat’s milk caramel drizzle. I’m not a blueberry person normally, but I trusted the chef because the avocado in the first dish was so good. I wasn’t disappointed here either. All the ingredients came together for me. The cake was tender, the ice cream had the sweetness I was looking for and the caramel touches were complex, but not overdone. The blueberries added a brightness to the dish and I enjoyed them (though I wouldn’t have complained if peaches or raspberries were in their place). 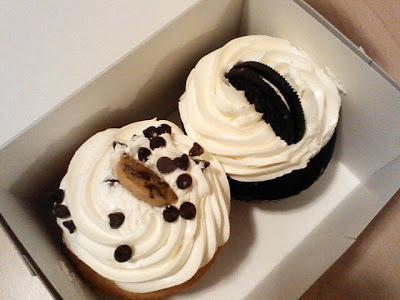 A friend of mine recommended we stop at Molly’s Cupcakes in the Lincoln Park neighborhood of Chicago. I was pleasantly surprised to find them open at 9:30pm on a Sunday night. They have an option for you to “create your own cupcake” while you wait (they actually do the ‘making’ for you), but we each chose one of their famous pre-made center-filled selections. I opted for a Cookee Monster — a vanilla cupcake filled with an artery (not just a vein!) of chocolate chip cookie dough and a light buttercream frosting with mini chocolate chips and a mini chocolate chip cookie! Very messy and gooey, but sooo good! I usually avoid writing about chain restaurants, but after a recent trip to Chicago I’ve decided to break my rule a few times for restaurants we don’t have back home in Michigan. The Counter is an casual customer burger chain with a wide selection of options for everything from the bun, to the meat (or meatless), to the toppings. We visited the location in the Lincoln Park neighborhood of Chicago. 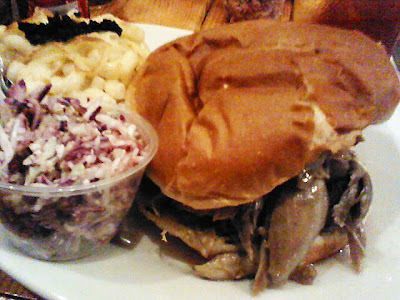 It has a few more “gourmet” options than most create-your-own burger options in the Ann Arbor, Michigan area, such as Bagger Dave’s or Great Plains Burger company. I loved having such a wide variety of options; part of the fun of a custom burger joint is trying something a bit different than what you’d get at Mickey D’s. The weight of the burgers noted on the menu is AFTER cooking rather than before, which is a departure from most restaurants and makes for really big burgers. Even the 1/3lb, which I got was a bit much for me and it was the smallest choice. I went for a beef burger with a pretzel bun and topped with herbed goat cheese, tomato, sauteed mushrooms and Dijon balsamic dressing. I though it odd that the sauteed mushrooms were considered a “premium” topping (an extra buck) since most places throw that in as standard. I thought the herbs in the goat cheese spread were a bit overpowering, but a nice change from cheddar. The Dijon balsamic dressing was really good! 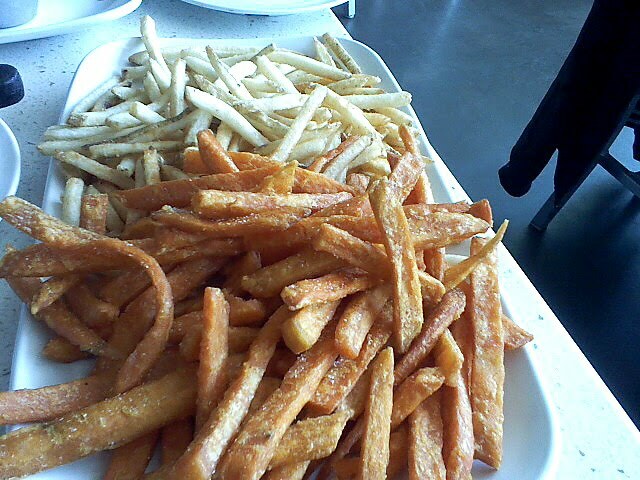 It went better with the sweet potato fries I ordered than their mayonnaise concoction. 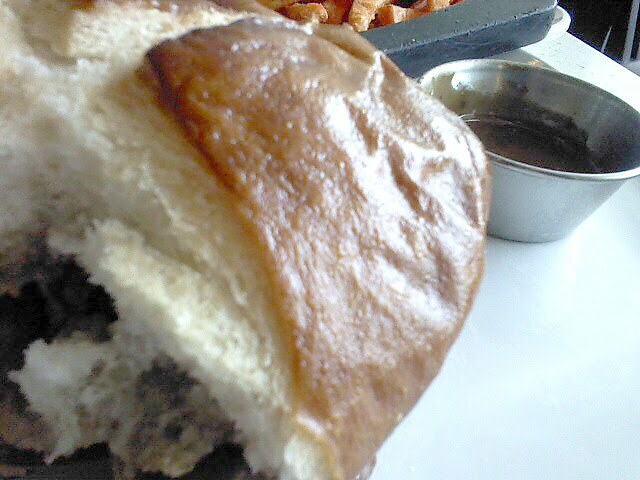 The pretzel bun was tender and flavorful a strong improvement over most boring hamburger buns. Service was decent and the food was good overall. I’d make another trip if I were back in the Lincoln Park area. I recently tried a recipe from the famous Canyon Ranch for their Pumpkin Crunch. It can sometimes be difficult to find shelled pumpkin seeds, but I picked up mine at Trader Joe’s and they probably stock them at Whole Foods, too. 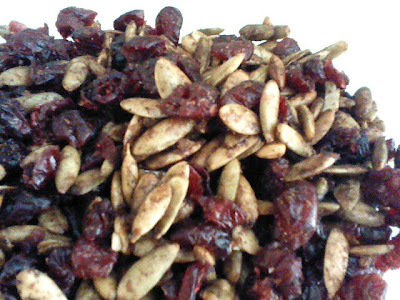 You start by tossing the pepitas with a little oil and roasting them once, then tossing them with spices and roasting them again to bring out a smoky, nutty flavor while the maple syrup caramelizes on the seeds. You finish by tossing in the cranberries (though any favorite dried fruit would substitute well here) and letting the mixture cool. Yum! Here’ a link to the Pumpkin Crunch recipe on the Canyon Ranch website. Enjoy!